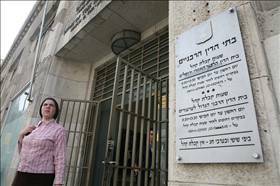 The Jerusalem District Court has nullified a divorce agreement in which a mother gave up custody of her small children by reason of her having left the haredi way of life. The website Psak Din reports that the court ruled that a parent cannot waive absolute custody of his or her children, and that the instruction contradicted public policy. The woman got married in 1997 and gave birth to three children. In 2005 she and her husband decided to divorce. In the divorce agreement that was filed in the rabbinic court the woman agreed to waive custody of her children, because she had chosen a different way of life than theirs and her husband’s. In the agreement she even permitted the husband to emigrate with the children overseas, and waived her rights to the couple’s apartment, car, and bank account. The agreement was approved and received the authority of a psak din. About a year later, the woman filed a request in family court to have the divorce agreement revoked, and her request was accepted. Her husband appealed the ruling to the Jerusalem District Court. In late January 2011, Judge Hana Ben-Ami denied the appeal. The judge ruled that a parent cannot give up custody of his or her children independently and without a legal adoption process. Any other interpretation is not in keeping with the general law and with the child’s welfare, she said. Therefore, even if the mother agreed to give up custody, she is not entitled to do so. The court further ruled that in the case in question the wife’s volition had been flawed, thereby casting doubt on the validity of the agreement: The woman was married at age 16, and by 19 was the mother of two children. The agreement was signed on the day before the divorce claim was filed, and was submitted a day later. It is worded in a one-sided manner and includes a sweeping forfeiture of the wife’s rights. She was not represented at the rabbinic court hearing, whereas her husband was. Moreover, the court ruled that, on the face of it, the instructions in the agreement pertaining to the waiver run counter to public policy, and must be nullified for this reason as well. “An agreement in which a parent waives custody of his children, solely because of his different religious way of life, stands in such clear contradiction to the accepted values of Israeli society, which include the right to parenthood, the child’s welfare, and the freedom of religion and conscience, and for this reason as well the relevant instructions are bound to be revoked,” the judge wrote.